A MASSIVE THANK YOU to you ALL for all your hard work on and off the tatami’s today. Excellent team work meant with 600 entries we were done and dusted by 5pm. First Aid reported they had no significant injuries to treat and great positive feed back from the Coaches with only minor issues to resolve throughout the day .This is down to your professionalism and, as already stated, excellent team work. I hope you all returned safe and sound to enjoy the remainder of the good weather over the bank holiday. I look forward to seeing you all in November – if not before. Rob Smith WKU Chair says: I would like to emulate Ivor’s words, a big thank you to everyone that helped at the competition yesterday, a lot of hard work from everyone before during and after the event. Again another competition that seemed everyone enjoyed even with the lovely weather outside. I would like to thank Ivor in arranging the officials which did a great job all day, it was also good to see a good amount of table officials and a thank’s to them. As you will be aware that a couple of little tweaks to the layout seemed to ease congestion a little, Susy looked like she enjoyed ‘crowd control’ !. Obviously I don’t have everyone’s emails addresses so if you could pass on thanks to the clubs and volunteer’s that came and supported this event. It was good to see everyone yesterday and hope everyone returned home incident free and look forward in seeing everyone soon. And from Susy Soravia: I want to thank you all for having me help out to judge at yesterday’s competition. It had been a real learning curve for me but I really enjoyed very much. It is also equally nice to see more of my old friends as well as making new friends. I look forwards to help out and meet u all again soon! 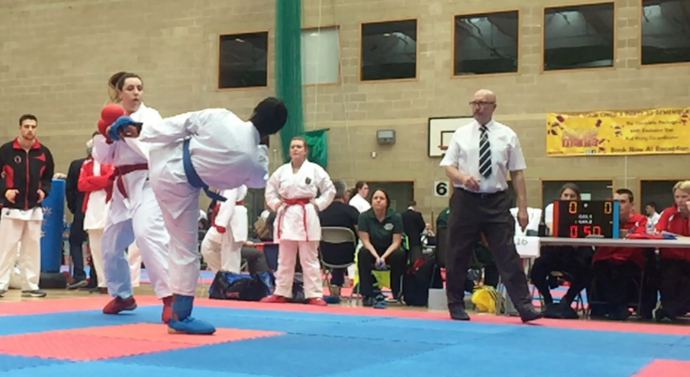 Tracey Archer commented: Thank you for the invitation to officiate at WKU competition, thoroughly enjoyed the day, look forward to the next event. Well done to everyone who took part either as a competitor or an official. WKU Chief Instructor, Alan Flook, said: Well done to all yesterday brilliant day, Alan.